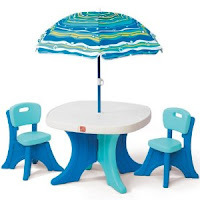 *HOT* Play and Shade Step 2 Patio Set Only $13.50 + S/H! (Reg. $50+) Earn 3% Cash Back! WOW!!! What a perfect little set up! This is perfect for young ones and you can’t beat this deal! JCPenney has the Step 2 Play and Shade Patio Set for just $15 right now!!! Once you are signed in at Ebates, find JCPenney and click to redirect you to the site. Do a search for Step 2 Play and Shade Patio Set when you get to the JCPenney site! Use the promo code EBATES10 and get another 10% off = $13.50. Shipping is $5.99 = $19.49 shipped! This same item is $59.99 right now on Amazon! Hurry over to Ebates and get this deal at JCPenney!!! I'm sure that these will be sold out in no time!